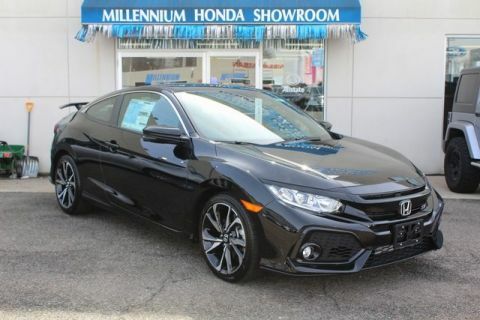 Millennium Honda is offering the exciting 2018 Honda Civic Coupe for your consideration. The Civic Coupe comes in a variety of model trims to suit all needs and budgets; LX, LX-P, EX-T, EX-L, Touring, and Si. All trims have exciting features such as a drive-by-wire throttle system, Eco Assist, electric parking brake with automatic hold, hill start assist, MacPherson strut front suspension, front and rear stabilizer bars, variable-ratio power assist steering, and 4-wheel disc brakes. The base engine is a 2.0 liter dual overhead cam i-VTEC 4-cylinder engine offering 158 horsepower and 138 lb-ft of torque. The standard transmission is a 6-speed manual, with an available continuously variable transmission (CVT). The EX-T uses a boosted 2.0 liter engine offering 174 horsepower and 162 lb-ft of torque, and the Si uses a 1.5 liter turbocharged and intercooled 4-cylinder engine with direct injection which develops 205 horsepower and 192 lb-ft of torque. Standard features of the Civic Coupe include projector beam headlights with auto on/off, body-colored side mirrors, automatic climate control, power auto up/down front windows, cruise control, 60/40 split rear seat, Bluetooth, 160-watt audio system with four speakers, power door locks with auto lock, vehicle stability assist, brake assist, antilock brakes with electronic brake distribution, multi-angle rearview camera with guidelines, tire pressure monitoring, LED daytime running lights, and more. 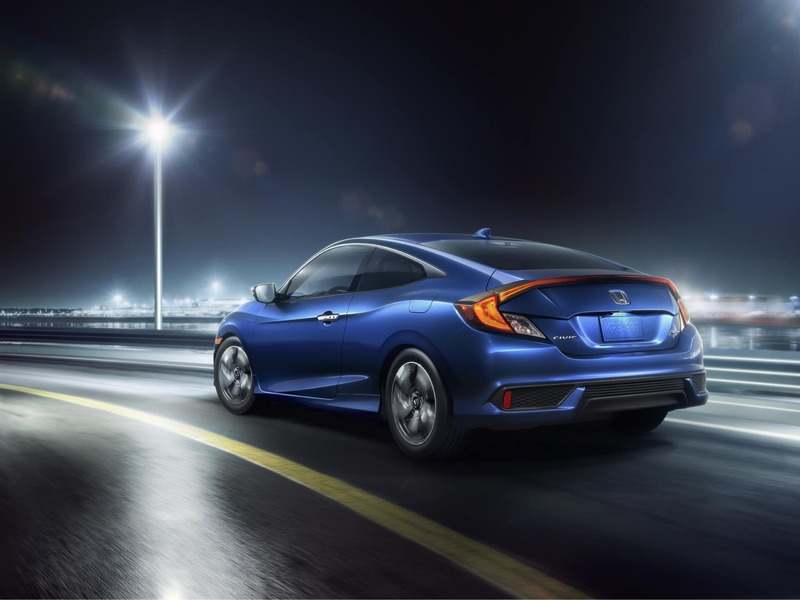 The Civic LX-P Coupe adds remote engine start, standard CVT, smart entry, push button start, and a one-touch power moonroof with tilt feature. The EX-T Coupe takes the EX-P features and adds or upgrades with a leather-wrapped steering wheel and shift knob, 17-inch alloy wheels, heated side mirrors, 7-inch display audio with high resolution touch screen, HondaLink, Apple CarPlay, Android Auto, 450-watt premium audio system with 10 speakers including a subwoofer, SiriusXM satellite radio, text message functionality, driver information interface, Honda LaneWatch, dual-zone automatic climate control, heated front seats, and fog lights. The Civic Si Coupe adds to or upgrades EX-T features with a limited-slip differential, 2-mode (Normal/Sport) drive system, adaptive damper system, 18-inch alloy wheels, lightweight Si sport seats with contrasting red stitching, Si-exclusive driver information interface, aluminum shift knob with leather accents, sport pedals, and available summer-only high-performance tires. The EX-L Coupe adds to or upgrades EX-T features with a standard CVT, leather-trimmed seats, and automatic dimming rearview mirror. And finally, the Touring trim adds to or upgrades EX-L features with LED headlights with auto on/off, rain sensing intermittent wipers, chrome door handles, Honda satellite-linked navigation with voice recognition and HD digital traffic, and Honda Sensing safety suite (collision mitigation braking, adaptive cruise control with low-speed follow, forward collision warning system, lane departure warning, lane keeping assist, and road departure mitigation system). The exciting and innovative 2018 Honda Civic Coupe is available for your review at Millennium Honda in Hempstead Nassau County. Stop by for a look and drive away with your favorite trim! * Based on EPA mileage ratings. Use for comparison purposes only. Your mileage depending on driving conditions, how you drive and maintain your vehicle, battery-pack age/condition, and other factors. Fuel tank capacity : 12.4gal.